Parents are juggling busy lives between working outside the home and caring for children and the home. So it’s no surprise that NPR recently talked about how stressful work can be. What was surprising is that a recent study showed the time people spend at work is actually the most relaxing part of the day; the real stress begins when they come home in the evening to family and home responsibilities. Some people NPR interviewed said home was stressful because there were children to care for and because you can quit a stressful job, but you can’t quit a stressful family or home life. However, there are ways to reduce the stress you feel at home, especially if you have young children. 1. Teach everyone to pitch in. There’s nothing more tiring than mom or dad doing all the work around the house. Children as young as 2 can start to have chores such as helping you sort laundry by colors. Six or seven year olds can sweep the kitchen floor. 2. Make sure everyone is getting enough sleep. You may think you don’t have time to sleep 7 or 8 hours a night, but your days will go smoother if you’re rested. The same goes for your kids. If they’re not rested, they’re more prone to meltdowns and tantrums. A good night’s sleep can make all of you a bit happier. 3. Do any tasks you can at night rather than in the morning. Getting the kids up and out the door for school as well as getting yourself ready can be one of the most stressful parts of the day. Eliminate much of the stress by doing as many tasks at night as you can. Pack the kids’ lunches in the evening so all you have to do is grab them out of the refrigerator in the morning. Help the kids lay out their clothes for the next day, so they’re ready to get dressed when they wake up. Pack up their backpacks and leave them by the door the night before. 4. Make a menu plan. Menu planning will make your evenings go more smoothly. Decide on the weekend what you will eat for the week and buy the groceries you need. You’ll never again be faced with “What should I make for dinner?” when the entire family is hungry and irritable. Pick simple recipes that you can put in the slow cooker in the morning so dinner is ready when you come home. Even better, put everything you need in the crock pot the night before. In the morning, just turn on the slow cooker. Another alternative is to take a day to make several freezer meals so you simply have to take the meal from the freezer to thaw in the refrigerator and then reheat it in the evening. Or make a few large meals on Sunday that you can eat all week long. 6. Make time to relax together. We live such fast-paced lives that we don’t take time together to relax. Have a family game night on the weekend or take time to watch your favorite show together. 7. Loosen up the schedule. Adults and children are overscheduled. If you find yourself in the car every night driving kids to one or two sports or after school activities, maybe it’s time to reduce your children’s extracurricular activities. Parents didn’t always have kids in so many activities. Kids need time to just unwind sometimes instead of having every moment scheduled. If you’re like the people on NPR who find being with family more stressful than being at work, maybe it’s time to try some of these techniques to manage your stress. 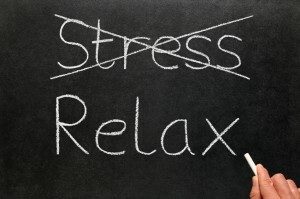 What’s your best tip for reducing stress at home? We’re naturally high-stress people so we take extra steps to make life easy on ourselves. Those include exercising, eating well, and trying not to sweat the small stuff! Great advice – I usually do laundry at night while we’re watching TV as a family, or sitting out on the deck. it doesn’t take long to rotate laundry.